When I was growing up, there was one dish that I demanded my mom to make for the holidays. That dish was called Chantilly Potatoes. 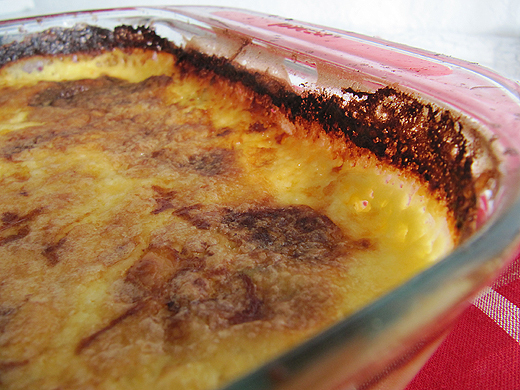 It is a wonderfully decadent casserole of mashed potatoes, topped with a layer Chantilly cream, and finally, a layer of cheddar and parmesan cheeses. Digging into it was such a treat. I have updated that dish with some tips from this year’s Thanksgiving edition of Bon Appetit. The article had some great ideas for creating some truly flavorful mashed potatoes. I particularly liked their recommendation of heating the milk with aromatics. It gives the potatoes a wonderful flavor. Heat oven to 375. I like using Yukon gold for mashed potatoes because I can get away with not peeling the potatoes. Dice the potatoes and place in a large pot filled halfway with cold water. Add 3 tablespoons kosher salt. Bring to a boil, then reduce heat and simmer until the potatoes are tender. Meanwhile, gently heat the milk, cream, garlic, peppercorns, bay leaves, and sprig of thyme in a small saucepan over medium heat. Don’t let the mixture boil. Once the mixture is very hot, take off heat and let the aromatics infuse the milk for 20 minutes. Strain out the aromatics using a slotted spoon. Mash the cooked potatoes with the butter and infused milk. Stir in chopped chives. Grease an 8 x 8 baking pan and a 9 x 13 pan. Spread the mashed potatoes evenly into the prepared pans. Whip the 2 ½ cups cream using an electric mixer. Spread the whipped cream over the potatoes, and top with the cheddar and parmesan cheeses. Bake for 45 minutes, or until the top gets a nice golden brown color.